I’d noticed that my vegetarian recipe for mushroom paté here on Not Delia seems to be quite popular, so I’ve come up with a variation on the theme for you. This is entirely my own recipe and not one I’ve adapted from somewhere else. This was made along the lines of “make it up as you go along”, but having decided what to chuck in, I did at least weigh the stuff to give you a fighting chance of being able to make something similar if you want to. Get the food processor out and add the ingredients as and when you get them ready. Wash the lentils and boil them in a pan of water until they get soft (20 minutes?). Drain. Add to the food processor. Chop the onions and garlic, sauté, add the hazelnuts. Cook for a few minutes. Bung into the food processor. Add the cream cheese and whatever butter is left after having used some of it for sautéing. Add whatever herbs you’ve chosen. Parsley or chives would be nice, I used dried tarragon. Blitz the mixture in the food processor until it’s as coarse or as smooth as you like. Taste. Would it benefit from salt and/or pepper? If so, then season it. Put into a suitable dish and let it chill down in the fridge. 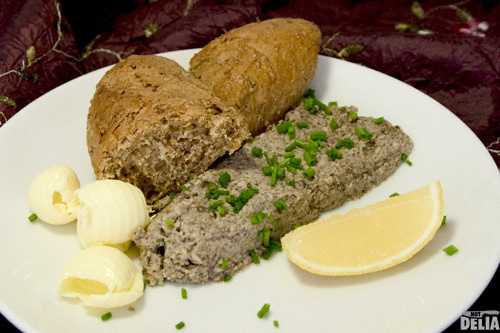 I served mine with a wholemeal roll, a few butter curls, a lemon wedge, and garnished with finely chopped fresh chives. They say that self-praise is no praise, but I think it was pretty good. Try it and see! If that’s not your scene, you can try my earlier attempt at mushroom paté, or if you’re a confirmed carnivore, why not make a chicken or pork liver paté? PS: an afterthought – Warning! This mushroom and hazelnut paté contains nuts.